Staff Sgt. Aaron N. Holleyman, 26, was a Special Forces medical sergeant assigned to 1st Battalion, 5th Special Forces Group (Airborne) at Fort Campbell, Ky. 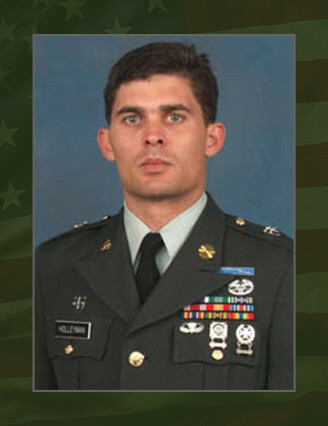 He was killed in action during Operation Iraqi Freedom on Aug. 30, 2004, near Khutayiah, Iraq, when an improvised explosive device exploded near his vehicle. A native of Glasgow, Mont., Holleyman enlisted in the Army in June 1996 as an infantryman. After completing infantry and airborne training at Fort Benning, Ga., he was assigned to Fort Bragg, N.C., in November 1996 as a platoon armorer in the 82nd Airborne Division’s 1st Battalion, 505th Parachute Infantry Regiment. After being selected for Special Forces training in 2000, Holleyman was assigned to Fort Bragg’s 1st Special Warfare Training Group (Airborne) in January 2001. Upon completion of his training as an SF medical sergeant, he was assigned to the 5th SFG in September 2003. Shortly after arriving at the unit, Holleyman deployed to Iraq in support of Operation Iraqi Freedom. He deployed in support of OIF for a second time in July 2004. Holleyman’s military education includes the Special Forces Qualification Course, the Basic Noncommissioned Officer Course, the Basic Airborne Course, the Combat Life Saver Course and the Survival, Evasion, Resistance and Escape Course. His awards and decorations include the Bronze Star Medal, the Purple Heart, the Army Commendation Medal, the Army Achievement Medal, the Army Good Conduct Medal, the National Defense Service Medal, the Noncommissioned Officer Professional Development Ribbon, the Army Service Ribbon, the Combat Medical Badge, the Expert Infantryman Badge, the Driver and Mechanic Badge, the Parachutist Badge and the Special Forces Tab. Holleyman is survived by two daughters and a son in Fayetteville, N.C.; his brother, Pfc. Daniel M. Holleyman of the Mississippi Army National Guard’s 2nd Battalion, 20th Special Forces Group (Airborne); and his parents, Ross and Glenda Holleyman, of Carthage, Miss.